This has been a long overdue post. The last two years, just before Jan 4 and June 27, I would make (mental) plans to come up with a song list of my favourite RD Burman songs, but the two days pass by; and the song list post never happened… up until now. Yes it is past June 27 this year also however, better late than never. I guess no introduction is needed for the Boss. Rahul Dev Burman is the one Hindi music director that most of the younger generations know about. In fact, when I was growing up, a complete Hindi music buff, I would find it rather strange that most of my friends (who did not share my enthusiasm for Hindi film music) would wax eloquent about RDB and know nothing about his illustrious father, Sachin Dev Burman (who is one of my favourite music directors). For someone who is now considered one of the most influential music composers of all time, this was not always the case. RDB or Pancham spent a long time under the shadow of his father (as his musical assistant, playing the harmonica. He is, however, said to have composed many compositions thought to be his father’s.). Born on June 27, 1939, before starting out as an independent music director with Chhote Nawab (1961). Success proved elusive for a while, before a dream run that started with Teesri Manzil (1966) and lasted until the early 1980s. Financial and marital troubles plagued him and he is supposed to have died an unhappy man fairly early on January 4, 1994, leaving behind a legacy that is unmatched. Choosing 10 songs was more difficult than I thought it would be. With my favourite music directors, SDB, and OPN, I have clear favourites (maybe because I do listen to their songs more often.) I know which songs I like and which wouldn’t make it to the cut. As I started listing the songs for this post, I found there were too many of them I liked. Should I then restrict the list to just include solos or have duets? Should I restrict these to just Hindi (there are many of his Bengali songs that are lovely, and not to forget some melodious Malayalam ones). Should I have a cut-off range(say 1960-1975 only)? Now, since I could just not decide, here are 10 songs that came to my mind, all solos sung by female protagonists (5 by Asha Bhosle and 5 by Lata Mangeshkar) in no order of preference. While the Burman father-son duo (other than OPN and Ravi) were largely responsible for Asha Bhosle’s rise to fame, her complaint was that their best songs went to her elder sister. Probably true. Asha Bhosle did get to sing for the vamp, and side character more often than not; and its another tale of how she capitalised on the opportunities presented to her! I have avoided including her super-duper cabaret numbers (solos and duets with Pancham da) on purpose – they could fill up an entire list. Hamein raaston ki zaroorat nahin hai (Naram Garam, 1981): A gem of a number that completely got lost in this small-budget movie starring Amol Palekar, Swaroop Sampat and Utpal Dutt. Panchamda re-used the tune resulting in that superhit Lata-Kishore duet, Saagar kinaare dil yeh pukaare (Saagar, 1985). Katra katra behti hai (Ijaazat, 1987): This Gulzar directed movie starring Naseeruddin Shah, Rekha and Anuradha Patel had four fabulous songs, all sung by Asha Bhosle, each one worth including in this or any other list. Gulzar and Asha Bhosle won the National Award for lyrics and singing respectively for Mera kuch samaan. It is a pity that Pancham da did not win an award for this marvellous soundtrack – which ranged from Mera kuch samaan to the ghazal, Khali haath shaam aayi hai. I was torn between Chhoti si kahani se, that brilliant number celebrating the rains and this one. Picked this one because of the sensitive lyrics and that amazing voice-over-voice effect that takes this composition to another level. Bechara dil kya kare (Khushboo, 1975): Picturised on an adorable Farida Jalal and Hema Malini, this is a typical sakhi song. In the context of the movie, Hema Malini’s bethrothed or (was it) husband (?) (a child marriage story) is coming back to the gaon from the shaher, if I remember right. So the heroine is happy and her best friend is teasing her. Playful and zestful, Asha Bhosle’s peppy singing is fully brought out by Farida Jalal on screen. In the late 1950s, Lata Mangeshkar had a fallout with SD Burman. During this period, SDB used Asha Bhosle as his main singer. Pancham, who was then branching out as a separate composer, wished that Lata Mangeshkar sing his official first song as composer but was not comfortable to approach her directly. The ‘rapprochement’ between SDB and Lata Mangeshkar was effected by Pancham da’s wish. For the sake of his son, SDB called and spoke to Lata Mangeshkar and the rift ended and the song, Ghar aaja ghir aaye from Chhote Nawab (1961) was composed and an association was formed. Lata Mangeshkar sang a number of songs for Pancham da (lesser in number perhaps, when compared to the no of songs Asha Bhosle sang but memorable nonetheless. 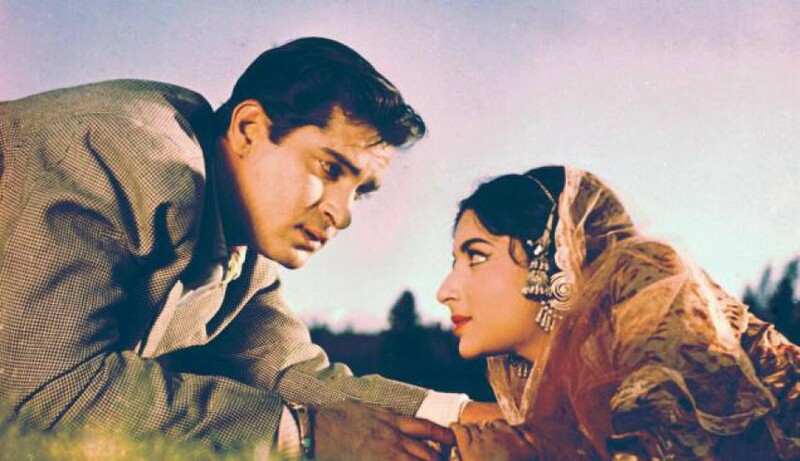 Kya janu sajan hoti hai kya (Baharon ke sapne, 1967): Starting with this absolute gem from his early phase, which was picturised on Asha Parekh and a very young Rajesh Khanna (a nobody back then). The film, a non-Nasir Hussain like movie, with a serious theme, flopped at the box office, despite the memorable soundtrack which has survived to this day. Chunri sambhal gori, Aaja piya tohe pyaar doon remain antakshari favourites and then there is that amazing cabaret Do pal jo teri. I picked Kya janu sajan for its brilliant use of the voice-over-voice effect and the orchestration. Raina beeti jaaye (Amar Prem, 1972): While Pancham da may have been known more for the Western touch he introduced in Hindi music, he did excel in composing some classical Hindi songs as well. This is a classical composition, in Gurjari Todi, which describes Radha’s anguish as she waits for Krishna (Shyam) to come to her, as promised but half the night is gone and the clock is ticking. Sung to perfection, Raina beeti jaaye is a masterpiece. Not just this song, the entire soundtrack is filled with musical gems (Yeh kya hua, Kuch toh log kahenge, and Chingari koi bhadke and Bada natkhat hai krishna kanhaiya) remembered even today. Kajre badarwa (Pati Patni, 1966): Many Pancham’s finest compositions did not get the name they deserved, simply because they have gotten lost in small films that bombed at the box office. This superb, melodious song picturised on Nanda as she waits for her husband is one such example. Romantic, sweet and absolutely magical. Rimjhim gire saawan (Manzil, 1979): Ending the list with another song celebrating the rains, simply because the rains have finally arrived here. While the Kishore Kumar version is probably more popular, I prefer the Lata Mangeshkar version of the song. Amitabh Bachchan and Moushumi Chatterjee do share a cute chemistry. This does feel incomplete. There are so many duets and solos by Mohd Rafi and Kishore Kumar, which should feature in a song post. So I guess this calls for a couple more posts eventually. Or maybe I should just say, this is the plan as of now! This entry was posted in Old Hindi songs and tagged Amitabh Bachchan, Asha Bhosle, Asha Parekh, Lata Mangeshkar, Moushumi Chatterjee, Nanda, R.D Burman; S.D. Burman, Rajesh Khanna. Bookmark the permalink. Oh, lovely! Yes, listing just ten songs of RDB’s would be a difficult task: he really did compose some amazing songs. I like (even love) many of those you’ve listed. (Incidentally, Humein raaston ki zaroorat nahin hai didn’t just inspire, it was inspired – like Roshan’s Tera dil kahaan hai and Rahein na rahein hum, from SDB’s Thandi hawaayein. Another RDB-Asha song I like a lot (and which Asha has called the most difficult song she sang) is Daiyya yeh main kahaan aa phansi from Caravan. Oh yes, this was a tough list to make. So many songs to choose from – and all from memory. He composed such lovely numbers. Felt rather dissatisfied in the end but had to stop thanks to lack of time this morning. I like Daiya yeh main kahan aa phansi very much too; left it out from this list on purpose actually. From my vague memory of the picturisation, I seemed to remember that it was a dance number/ some kind of performance and for this list, I wanted the softer songs that Asha has sung for Pancham. Her dance numbers composed by Pancham require an entire list – so many of them and sung so well.